This is an answer to a list of questions being passed around on Muslim websites. Whoever wrote out these questions has never seen the sort of concepts we deal in here, which will be the basis for our answers. If Jesus was GOD, then why in Mark 12:29 did Jesus say, "Here, O Israel: The Lord our God is one Lord." The words "our God" indicate that Jesus had a higher God over him, a stronger God than him. Jesus didn't say "Your God". He said "our God" which includes Jesus as the creation of GOD. Of course, the major error right away is to treat theos in the NT as a proper name, as "God" is used today. Allah" is the proper name of the Muslim deity, but "God" is not the proper name of the Jewish-Christian deity; His name is Yahweh -- not "God", not "theos". Second error: The inability to distinguish between ontological equality and functional subordination. The question fails to realize that Christian Trinitarianism does, and always has, believed that the Father is "higher" and "stronger" than Jesus. The Father is Jesus' "boss". But as an attribute of the Father, Jesus does have ontological equality with the Father even so. As for "our God", the answer is the same: This is an expression of functional subordination, so that it does not affect that Jesus shares in the divine identity of YHWH. If Jesus was GOD, then why in John 20:17 did Jesus say, "I ascend to my God and your God? This tells us that we and Jesus have a common GOD. If Jesus was GOD, then why in John 8:28 did Jesus say, "I do nothing of myself"? Can't GOD do anything he wills? If Jesus was GOD, then why in John 14:28 did Jesus say, "My Father (GOD) is greater than I"? If Jesus was GOD, then why in Luke 23:46 did Jesus say, "Father (GOD), into thy hands I commend my spirit"? If Jesus was GOD, then why in Matthew 19:16 did Jesus say, "Why call me good, there is none good but One, that is GOD"? Apparently American Muslims composed this question, because if they were from the Eastern side of the world, they would know what was going on here. From this passage the idea is sometimes taken that Jesus is denying his own goodness, and therefore, refuting any chance of being recognized as part of the Godhead. The standard explanation is that Jesus is essentially saying to the ruler, "Do you know what you are implying? You say I am good; but only God is good; therefore, you realize that you are identifying me with God?" [Brooks, commentary on Mark, 162] In Jewish thought, God was pre-eminently good, so that the ruler was indeed offering Jesus a compliment usually reserved for God. Since it is quite unlikely that the ruler truly believed that Jesus was identifiable as God the Son, this looks more like an effort by Jesus to make the man think about what he is saying before he blurts it out or engages in indiscriminate flattery. Confirmation and elucidation of this explanation is found in Malina and Rohrbaugh's Social-Science Commentary on the Synoptic Gospels (123) in which they explain that in an agonistic (honor-shame) culture, a "compliment" like the rich young man's is actually a challenge and an attempt to put Jesus "on the spot" for they are an implicit accusation that one has been trying to rise above others. 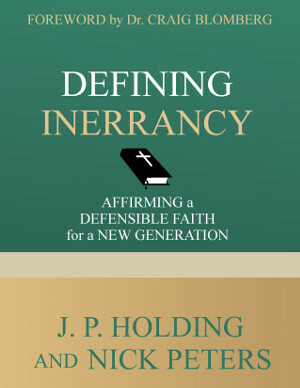 Jesus' only alternative was indeed to parry the compliment and redirect it to its appropriate subject (unless he wanted to reveal himself directly and fully, in which case, his claim would have been another challenge of honor to others), thus showing himself honorable by diffusing any accusation that would arouse the envy of an opponent. Muslims have this idea that Jesus was removed from the cross during the crucifixion, and replaced by Judas. That's beyond our scope here. Otherwise this is the same error of ontological vs. functional subordination. If Jesus was GOD, then why in John 18:38 didn't he reply when he was asked about the truth? One wonders how the questioner here gets the idea that Pilate was actually asking for some sort of epistemic revelation, as opposed to expressing his frustration; as if to say, "What is truth? There is none." Of course, if that was indeed what he was asking for, a scene from The Hitchhiker's Guide to the Galaxy series illustrates the problem: It would take a very long time to answer this sort of question, and by then, Pilate and anyone else in the room would have gone insane. If Jesus was GOD, then why in Matthew 24:36 did Jesus tell his followers that no one (including Jesus) knows when the judgment day will come, only GOD knows? This is also reflective of a rather simplistic view of the Trinity. It is related to another matter, actually, that of places where Jesus somehow seems to be ignorant of things -- leading to the question, "How can Jesus be God, yet not know things (i.e., not be omniscient)?" The typical answer is that Jesus emptied himself of his power; what we refer to, in terms of Christ, as a kenotic emptying (Phil 2:6-11). Note that this should be viewed in line with the "dual nature" (human/divine) of Christ and NOT the "kenotic heresy" which abuses Phil. 2:6-11. In the view being explained here, Christ's "human nature" is the kenoticized one. The divine consciousness remains intact but is not accessed or used under typical circumstances. To put it another way, the incarnated Jesus is Wisdom with "half its brain tied behind its back." The attributes are accessible, but not used. Jesus does not know the day or the hour because the Father has not yet "spoken" the word yet (in the temporal realm, related to the human nature; this does not speak to knowledge in the eternal realm and the divine nature) that declares the day and hour. But Christ emptied himself of his divine power to enter the temporal realm, and so does not know the day or the hour. If Jesus was GOD, then why in Isiah 11:2-3 did GOD put the spirit of fearing GOD in Jesus? Where the idea is gotten that Is. 11:2-3 is about Jesus, we can only guess. I assume they are misunderstanding ideas of the NT use of OT prophecy, but since that was a method where passages could be freely isolated from context (see here) there is no call to say that every part of Is. 11:2-3 needs to be applied (though really, "fear" here means "reverence and respect" anyway). If Jesus was GOD, then why in John 5:31 did Jesus tell his followers that if he (Jesus) bears witness of himself, then his record is not true? This is a point that the Skeptics often use for their own purposes, but here the implication is that Jesus, as God, ought to be able to bear witness for himself. What is not understood is that the grammar indicates that what is being said is, "If perchance I bear witness." The context thus indicates that Jesus is discussing the hopelessness of a man's testimony being accepted alone. Deut 19:15 says that two or three witnesses are required for acceptance of a testimony. Jesus is thus stating that the Jews won't find his witness true, because the Jews think that Jesus is alone testifying concerning Himself; he is not at all stating that in reality His witness is not true: He is merely acknowledging what the Jews are or might be thinking. Jesus knows that His witness is true, for in reality it is -- but the Jews fail to recognize that "another bears witness" in 5:32, clearly a reference to God the Father. If Jesus was GOD, then why in John 5:30 did Jesus tell his followers that he can't do a single thing of his own initiative? If Jesus was GOD, then why in John 5:36-38 did Jesus say that GOD had assigned him (Jesus) work and GOD is a witness on Jesus? If Jesus was GOD, then why in John 5:32 did Jesus tell his followers that they have never seen GOD at anytime nor ever heard his voice? His "followers"? John 5:32 is spoken not to Jesus' followers but to his opponents, and it isn't even this passage. It is 5:37, and that also is to his opponents. It is also the Father, not "God," whose voice is not heard. So this is an example of the first confusion over use of "God" as a proper name. If Jesus was GOD, then why in Matthew 26:39 did Jesus fall on his face and prayed to his GOD? Note: The only unique title given to GOD in the Bible that was not given to others at all are Jehova, GOD, and GOD LORD. "God", "Most Mighty" and "Almighty One" are titles that were given to Jesus, other Prophets and to Satan himself in the Bible. But in the NT Jesus is called "Lord"; he is included in Paul's revised Shema in 1 Cor. ; and he is identified with divine hypostatic Wisdom all through the NT (again, see linked article). Very important note: Did you know that in the languages of Arabic and Hebrew the father of the house can be called the God of the house? Jesus was the God (father or leader) of his people and their father according to Isiah 9:6. Jesus being the leader and the king, it is normal for him to be called the father of his people (Father in Isiah 9:6), and because he is their father he automatically becomes their God. My father is my God in Arabic and Hebrew. In Exodus 4:22 "Thus saith Jehova, Isreal is my son, even my firstborn." Isreal was called God's First Son. In Jeremiah 31:9 "I am a father to Isreal, and Ephraim is my firstborn." Ephraim is God's First Son and First Born. In Psalm 2:7 "... Jehova had said onto me (David), thou art my Son; this day have I begotten thee." David was called God's Begotten Son. A final section asks, Were Jesus' Miracles Unique? If Jesus is believed to be GOD because he could do miracles, he could heal leprosy, he could cause blind men to see, or raise the dead, then what about the others who performed the same miracles? Elisha and Elijah fed a hundred people with twenty barley loaves and a few ears of corn (2 Kings 4:44). Yes, and so Jesus fed 50 times as many with less. This is exactly what we would expect. Elisha told Naaman, who was a leper, to wash in the river Jordan (2 Kings 5:14) and he was healed. Elisha caused a blind man to see in (2 Kings 6:17,20). Yes, and so we would expect Jesus to do the same (and he would hardly tell the blind and lepers, "Sorry, you'll just have to suffer; Elijah did one like you already"! ), and even amplify (he healed lepers with mere words). Elijah and Elisha raised the dead in (1 Kings 17:22, and 2 Kings 4:34). Even Elisha's dead bones restored a dead body in (2 Kings 13:21). The answer is the same, though of course, it is hard to amplify raising someone from the dead. Indeed Jesus had prophesied that people will worship him uselessly and will believe in doctrines not made by GOD but by men "But in vain they do worship me, teaching for doctrines the commandments of men. (Matthew 15:9)"
In Matthew 15:9 above, we see Jesus warning that Trinity (the bogus lie) will dominate, and people will take Jesus as GOD and worship him, which is a total sin according to what Jesus said !! Jesus is quoting Isaiah about vain worship of YHWH, and was speaking not of worship of a false deity, but hypocritical worship of a true one. There is nothing here of false doctrine. Muslims believe that Prophet Jesus (peace be upon him) is a messenger from God. He was sent from God Almighty to deliver God's words to his people. Jesus was never God, nor ever claimed to be God. Jesus was a humble wonderful human being just like the rest of the Prophets and Messengers of God. Muslims also believe that Jesus was never crucified, nor ever died on the cross, nor ever wanted to die on the cross, nor ever was sent to earth to die on the cross. Well, more research is needed on the divine claims of Jesus then.